You are on Shared Section (Getting Here). Skip to the next section. 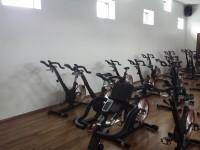 You are on Sports Hall. Skip to the next section. 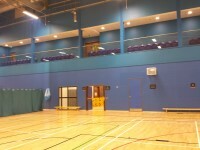 The sports hall is located on the ground floor, to the right after the reception, at the rear of the corridor. 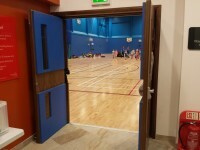 There are double width doors to access the sports hall. There is step free access throughout the sports hall. 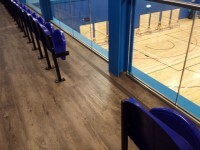 The surface of the flooring is wooden. There is surface of the floor is shiny which could cause issues with glare or look slippery to some people. 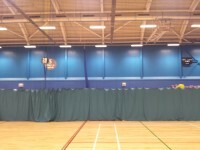 The layout of the sports hall varies depending on the sport or event taking place. You are on Studios. Skip to the next section. The are 4 studio located on the ground and first floors. 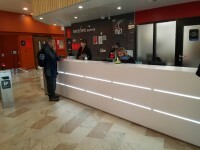 There is step free access to the studios. 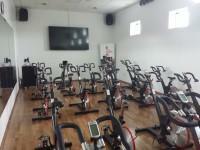 Studio 1 is located on the ground floor and studios 2, 3 and 4 are located on the first floor. The doors into the studios vary between single width with a locked leaf or a double width door. 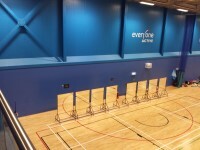 The layout of the studios vary depending on the activity taking place. 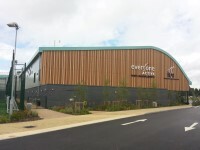 Studio 1 on the ground floor is used as the leisure centre crèche. You are on Ground Floor Changing Rooms. Skip to the next section. 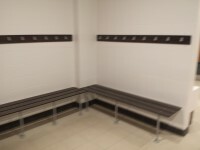 The ground floor changing rooms are located along the corridor. There is step free access to the changing rooms. 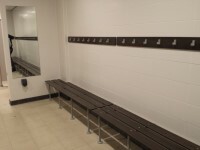 The football changing rooms are accessed by two sets of single width doors. Both sets of doors open away from you (push) and the width of the door opening is 85cm. 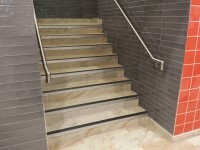 There is step free access throughout the changing rooms. There are changing benches available. 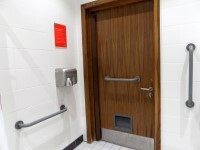 There is an accessible changing room located in the standard changing room. 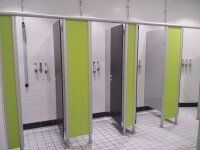 There is step free access to the standard shower cubicles. 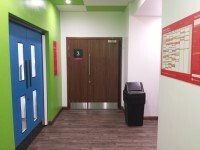 You are on Accessible Changing Room (Ground Floor Changing Rooms). Skip to the next section. 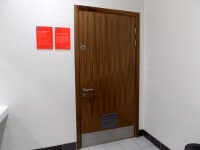 The accessible changing room is located in the ground floor changing room. 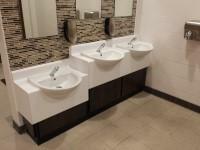 There is a facility with similar specifications in the female changing room. 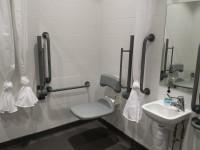 The accessible changing room(s) is/are approximately 5m (5yd 1ft) from the Sports Hall. 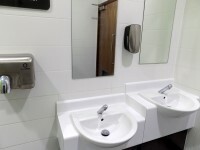 The female and male toilet facilities that were surveyed are located in the ground floor changing rooms. 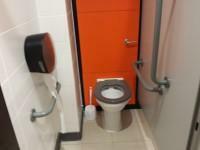 The female and male toilets are approximately 5m (5yd 1ft) from the Sports Hall. 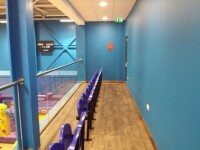 You are on Designated Seating Area(s) (Spectator Viewing - Sports Hall). Skip to the next section. There is step free access to the designated seating area, via lift. 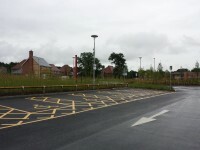 There is/are 2 designated space(s) for wheelchair users in the seating area. You are on Exclusive Changing Rooms. Skip to the next section. The exclusive changing rooms are located on the first floor. 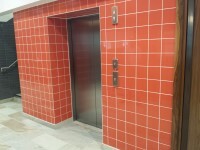 There is step free access to the changing rooms via lift. 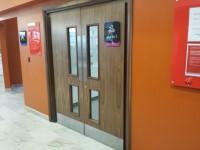 The exclusive changing rooms are accessed by two sets of single width doors. Both sets of doors open away from you and have a width of 85cm. The second set of doors have a security key fob. The height of the security hob is 98cm. 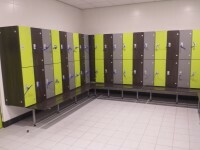 There are low level lockers available. There is an accessible changing room available to the right after you enter. At the rear of the changing rooms there is a spa area. The spa area contains a Sauna and Steam Room. 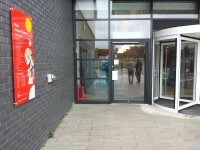 There is step free access to both facilities. 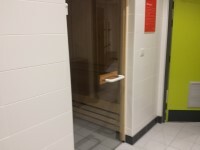 The doors into both the Sauna and Steam Room open towards you (pull), are single width and have an opening door width of 85cm. You are on Accessible Changing Room (Exclusive Changing Rooms). Skip to the next section. 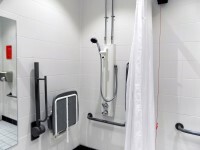 The accessible changing room is located in the exclusive changing rooms. 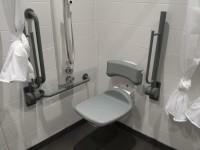 The accessible changing room(s) is/are approximately 8m (8yd 2ft) from the fitness suite. 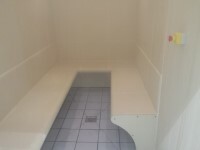 The dimensions of the accessible changing room(s) are 245cm x 240cm (8ft x 7ft 10in). 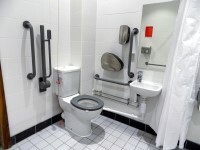 The fixtures/facilities available in the accessible changing room(s) include; a chair/stool, a toilet, a wash basin and a wheel in shower. The mirror is placed at a lower level (60cm from the floor) or at an angle for ease of use. The height of the seat is 49cm (1ft 7in). You are on Standard Toilet(s) (Exclusive Changing Rooms). Skip to the next section. There is step-free access to the female toilet(s), via lift.